The controls are tight, if a bit unresponsive at times, while the menus are clear and understandable. Draconus isn’t the gods’ gift to the human race when it comes to action/adventure hybrids. But neither is it a bad game. Its flaws can’t hide the fact that, underneath it all, Draconus: Cults of the Wyrm is a damned fun title. It may not be deep, it may not be a System Shock, but it’ll keep you hella entertained for a few hours. And that’s why we play games anyway, isn’t it? I’m really surprised more people didn’t give this game a chance when it was released; if you haven’t noticed I’ve really taken a liking to it, even with it being well over a year old. Titles like Square’s The Bouncer don’t play near as good or last half as long. This game comes highly recommended for all you Dreamcast gamers looking for something new to play, especially since you can usually find it between $10 and $20. More hack-and-slash/walk-and-punch adventure games have come out over the last year than in any other time since the days of the Super Nintendo and Genesis. Only a few, though, have adequately instilled the thrill of the old 2D titles - where timing and skill ruled the day - into 3D gameplay. It's funny that Treyarch, a developer known best for its PC title Die By the Sword, would be able to do that with its first console game, a 3D hack-and-slash with a brain called Draconus: Cult of the Wyrm. Aside from the storyline shortcomings, a bit of slowdown at times, and the at-time repetitious action (hack, walk, hack, walk), this is easily one of the best sword-swinging action games on the Dreamcast so far. Overall, I had a good time playing through Draconus: Cult of the Wyrm. While the game certainly has problems (most notably in the graphics department), they don't really detract from the overall fun of the game. Plus, when one considers that this was Treyarch's first attempt at a console game, I think the results are pretty impressive. Komisch... zu Beginn macht Dragons Blood gar nicht mal sooo viel Spaß, doch je länger man spielt (Was? Schon wieder fünf Stunden vorbei? Ich wollte doch nur schnell den Level beenden...), desto mehr macht dieses simple Gameplay Laune. Na gut, die Kampf-Engine ist nicht gerade ausgefeilt und schwächelt vor allem im Kampf gegen mehrere Widersacher gleichzeitig, doch daraus lässt sich sogar eine Strategie schmieden: Einfach langsam durch die Gegend schleichen und Gegner einzeln aufs Korn nehmen, lautet die Devise. Dass Grafik (auch trotz der dichten Nebelwand) und vor allem die geniale Sounduntermalung ebenso von hohem Niveau sind, erfreut dabei umso mehr. Selten hat Charakter-Aufleveln so viel Spaß gemacht! As an example of fantasy gaming, Draconus is by the numbers stuff, but as a videogame, it hits all the right notes: varied missions, lots of cool looking monsters, vicious looking weaponry and massive castles. If only the fighting system had been as impressive, I'm sure Draconus could have been a resounding success rather than the obscure title it is today. If you can see past these technical details, and can stomach the heavy fantasy hack 'n slash theme you'll have a lot of fun with Dragons Blood. It's not particularly original, and borrows a lot from previous action titles like the Nightmare Creatures series on the PlayStation, but it is a lot of fun and with fifteen large levels it offers an awful lot of bloody barbarian brawn for your buck. So, while Draconus has its very visible faults, the enjoyable basics are definitely in place to convert even the most jaded anti-RPG player out there. Before you know it, you'll be hitting those Renaissance fairs, and going for a king's feast at Medieval Times. If nothing else, you'll get dozens of entertaining gameplay hours out of this game. Es ist schon so eine Sache mit Dragon‘s Blood. Während die Story ein hervorragendes Fantasy-Ambiente schafft, vermag mich die optische Seite nicht ganz zu überzeugen. Ein wenig mehr Details in den Levels hätten sicherlich keinem geschadet. Demgegenüber weiß die klare Sprachausgabe absolut zu gefallen. Was bleibt, ist alles in allem ein netter Zeitvertreib für zwischendurch, dem jedoch nicht zuletzt aufgrund fehlender taktischer Möglichkeiten während der Kämpfe mit den Gestalten der Dunkelheit alsbald die Puste ausgeht. Nur für Fantasy-Fans! 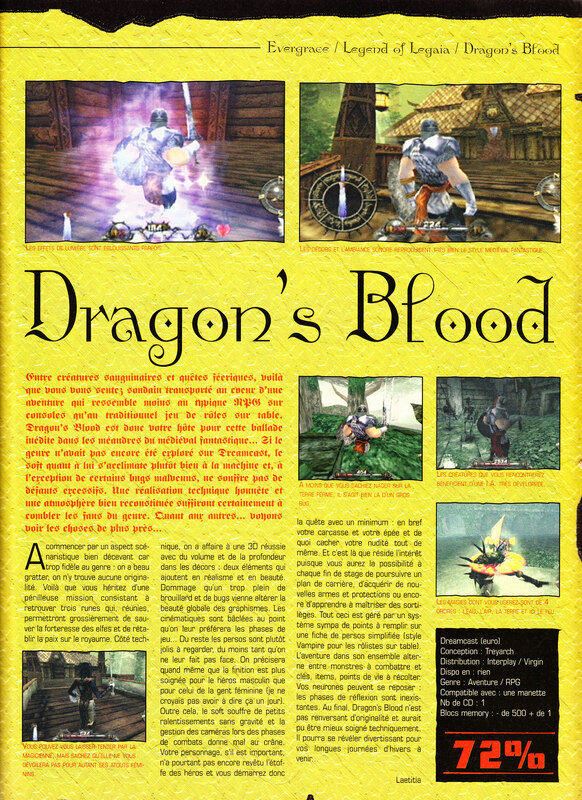 En bref, Dragon's Blood n'est pas un mauvais jeu mais il n'est pas pour autant bon. De lourdes fautes gâchent les quelques attraits novateurs, on s'amuse un peu mais on y revient pas. Back to the point that I opened this with. My bank account is short $59.52 thanks to D:CotW. Sure, my payment for this review will cover that cost, and put a few extra bucks in my pocket. But that isn't the point. The point is, for a lot of people out there (myself included) $59.52 cents is a lot of cash to just throw in the garbage. And let me tell you something, simply tossing that cash in the trash would have at least allowed some interesting intellectual discourse (after the part where my wife says "why is there $59.52 in the garbage?") Is money really important? Is it really real at all? Or is it simply pieces of paper to which human beings have attributed unwarranted value? If all the money in the world was simply thrown away and made valueless, what would become valuable? Spending time having such lightweight philosophical discussions is far better than spending time playing D:CotW. All in all, Draconus is a worthwhile contribution to the Dreamcast library and an ideal "$39.99 and under" title, even if it has "could've been" written all over it. Though far from a must have, it's definitely a picker upper if the price is right.